Chelsea boss Maurizio Sarri has commented on Kepa Arrizabalaga ahead of his side’s encounter with rivals Fulham on Sunday. The Spaniard created a controversial storm during the Carabao Cup final last weekend, as he seemingly refused to come off in extra-time ahead of the penalty shoot-out with Willy Caballero waiting to come on. 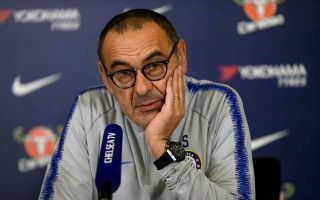 Both Sarri and Kepa have since insisted that it was a misunderstanding and miscommunication which led to the controversy which left the Italian tactician livid on the sidelines. However, the shot-stopper was later fined and dropped for the win over Tottenham in midweek, and so it remains to be seen when he returns to the starting line-up. Sarri was giving nothing away in his press conference on Friday as Chelsea prepare to face Fulham at Craven Cottage this weekend, as he noted that Kepa would return in one of the next two matches, with the next fixture after Sunday being the Europa League clash with Dynamo Kiev. The former Napoli boss appears to have sent a clear message to his first-choice goalkeeper this week, but it will be interesting to see what happens if Caballero continues to impress and keeps another clean sheet in terms of whether or not he’ll be dropped. Nevertheless, the focus for Chelsea has to be on securing all three points this weekend as they sit three points adrift of fourth place.